Preheat oven to 350°F. Lightly coat a 9x13-inch baking dish with nonstick cooking spray, set aside. 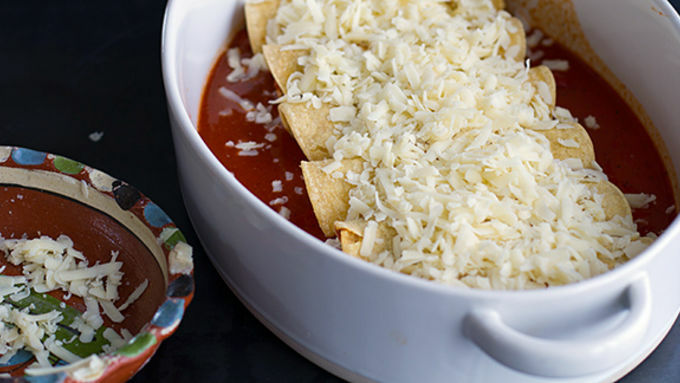 Add the remaining enchilada sauce to a large shallow bowl and warm in the microwave for 30 seconds to 1 minute.Dip one tortilla at a time through the enchilada sauce until the tortilla is slightly softened. Fill each tortilla with a sprinkle of cheese and a little of the chorizo mixture. Roll up and place seam-side down in the baking dish. Repeat with remaining tortillas and filling. 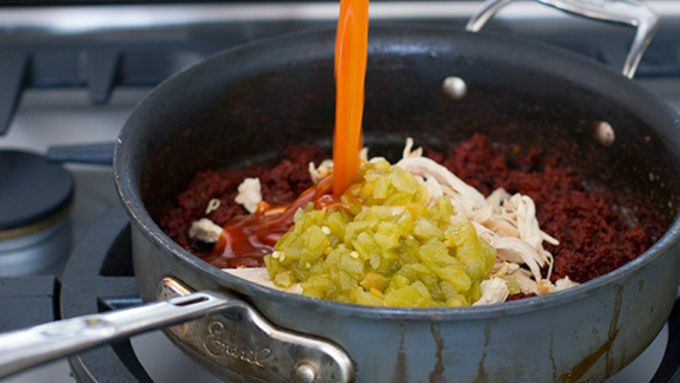 Pour any remaining enchilada sauce over the enchiladas. Cover the tops of the enchiladas with the remaining cheese. 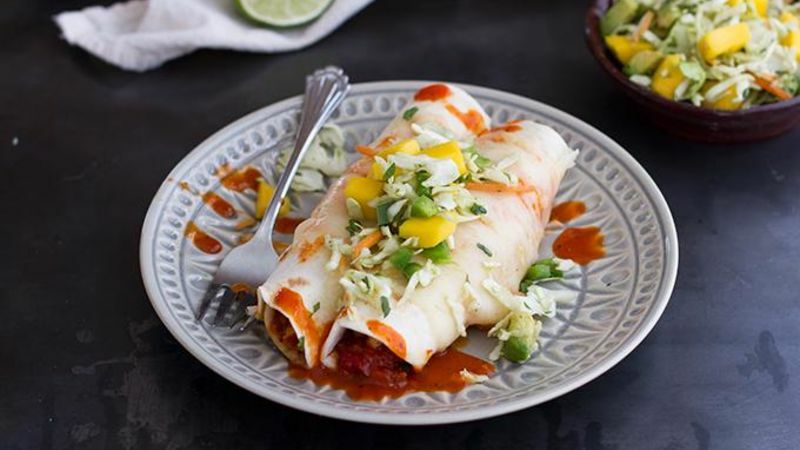 With chorizo and chicken, roasted red peppers and so much yummy cheese, these enchiladas will satisfy even supreme Mexican-food cravings. 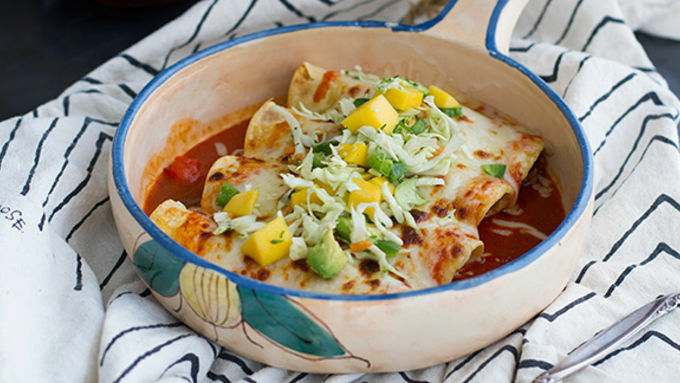 These are truly the ultimate in enchiladas. 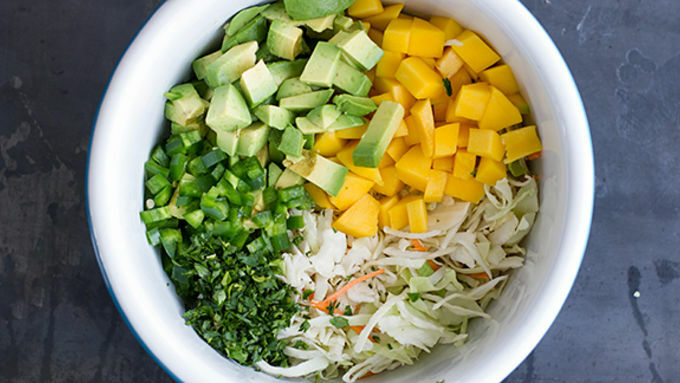 Top them off with a fresh avocado mango slaw and you’ve got a balanced, delicious and irresistible springtime meal. Trust me, this meal does not disappoint! Honestly, as I was rolling up the enchiladas. I had to continuously knock people’s hands out of the chorizo mixture. They just would not give up, and keeping hands out of these photos was beyond difficult. The second I took my last photo, they went in for the kill. I can’t blame them though; the smells wafting through the house were tortuous. Definitely too good to resist! The bonus is these are super simple, quick and easy to make. I used Old El Paso enchilada sauce to make them extra flavorful – and clearly lots of cheese. Because, well ... cheese makes everything so much better! Serve them up right away!